Yoast SEO Or SEOPressor Connect? Which Is Best To Use? There are two very popular and powerful SEO plugins for WordPress that is worth talking about. WordPress SEO by Yoast and SEOPressor Connect. But, which of the two should you use for your WordPress blog or website’s SEO? As some of you may know, I’m a huge, huge fan of the WordPress SEO by Yoast plugin. I have been using the Yoast plugin since I started my blogging venture back in 2010. I’m pretty loyal when it comes to the tools and services that I use in my business, especially if it’s working just fine for me. This is to say that the WordPress SEO by Yoast plugin has been an amazing tool over the years, and the improvements and updates just keep on getting better each time. That being said, I’m always curious and up for trying out new tools. A good few years back (2012), I tested a totally different SEO plugin called SEOPressor (Before it transitioned into SEOPressor Connect). I had read a lot of positive reviews about SEOPressor at the time, and so I wanted to give it a spin on a new blog project I was creating. SEOPressor wasn’t free, just to be clear, this thing was going to cost me a whopping $50, again, this was around 2013. However, I wanted to see whether it was actually worth the $50 price tag. Sounded like a pretty ludicrous idea, right? Especially when the Yoast plugin was completely free and there wasn’t a premium version of Yoast SEO yet available. Anyway, after debating whether to buy SEOPressor or not, I finally did it and forked out $50 that I didn’t really have, for a single site license. Ouch! Fast forward to 2018, at the time of updating this review, and a lot of things have changed for both of these awesome SEO plugins. SEOPressor has gone through quite a few revisions, and after SEOPressor 5 came SEOPressor Connect I believe. SEOPressor Connect is now in version 6.2, and it’s only available via a single subscription plan of $9 per month. 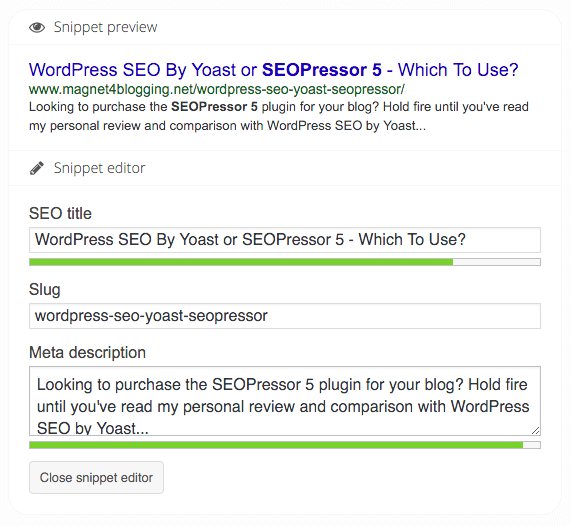 And, we also have a premium version of the mighty Yoast SEO plugin too. The great thing was because I had already purchased SEOPressor back in 2012, I was automatically given access to the new plugin at no additional cost. Great stuff, right? Unless, of course, I wanted to subscribe to the monthly plan to get the free updates and everything else that went with it. Over the last three years, I’ve really enjoyed using both of these plugins, and guess what? I love them both. I’m not going to give you another ‘middle of the road review and comparison’, because there can only be one winner here, right? I’m going to compare both the free version of Yoast SEO with SEOPressor Connect since SEOPressor does not have a free version of the plugin available. I’ll then shed some light on the premium version of Yoast as well, and compare it with SEOPressor Connect. Let’s start with SEOPressor Connect, shall we? Actually, before we dive into the features list, let’s first look at what benefits could be gained from using this plugin. Saves time – Optimizing your content with SEOPressor is quick. It’s user-friendly – Nothing is too technical as far as user interface goes. Assisted – SEOPressor Connect provides optimization tips and suggestions for each post/page, so you’re not left in the complete darkness about what to optimize. Drive more traffic – You can optimize for multiple keywords for each post or page, meaning you have the potential to drive more search engine traffic to your content. Now, let’s dive into the SEOPressor Connect plugin options and features list. As I mentioned earlier, SEOPressor Connect is now available on a single subscription plan priced at just $9 per month. For that monthly fee, you’re able to use the plugin on multiple domains, meaning it’s a multi-site license. This makes SEOPressor extremely cost-effective and very competitively priced, at only $108 per year. SEOPressor Connect offers improved on-page analysis, taking into consideration common things like word count, content readability, keyword density, LSI and more. Much of these features, by the way, can also be found in both the free and premium versions of Yoast SEO plugin too. I love the optimization suggestions on where and what to improve on with SEOPressor Connect. In addition, the plugin responds very quickly as you work with it. There is very little lag, in fact, which was one of the issues I found when using previous versions of the plugin. When you’re working on your content using this SEO plugin, there is no need to keep saving your work to see the changes. You’re optimizing in real-time with SEOPressor, and you simply refresh the analysis tool itself. When you’re happy with everything you can go ahead and save changes you’ve made to the entire post or page itself. See image to the right. This was one of the features that really impressed me in SEOPressor version 5. The over-optimization feature is still present in the new version I’m happy to say. So, what is this feature and what can you use it for? Well, as we all know Google can pretty much penalize any website if they believe it to be violating their guidelines, in this case, having too many over-optimized pieces of content. For instance, posts and pages that have been stuffed with keywords, excessive anchor text links, etc. So, this little feature lets you know when you’ve over-optimized your page with a warning. See below. In comparison with Yoast’s single focus keyword, this was another feature that caught my attention. But then again, we are talking about a premium plugin here. Originally, SEOPressor 5 allowed users to optimize for multiple keywords/phrases, giving them a better overall chance to rank for other ‘content related’ keywords and phrases. This feature is still very much present in SEOPressor Connect. You could probably try and optimize for multiple keywords using the free version of the Yoast plugin by changing the focus keyword each time you’ve optimized for it, however, that would be quite time-consuming, to say the least. Another thing to note, the premium version of Yoast SEO does provide extra features to optimize and rank for multiple keywords. #4. Insights and audit tools – Now, this I really love with SEOPressor Connect. 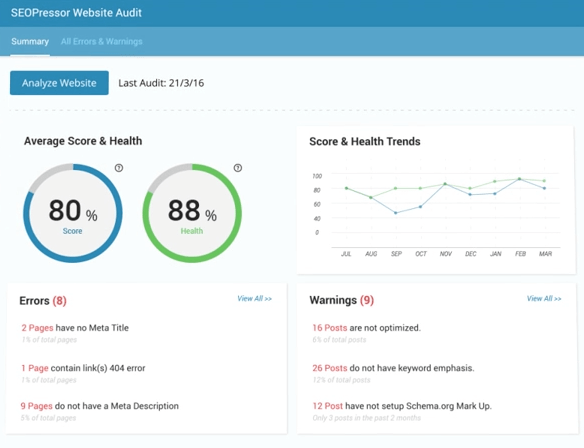 You can get real SEO insights using the tools provided in your website audit dashboard to help you optimize for SEO sitewide. Features include SiteWide SEO audit, SEO score manager, and trends. As the world moves more towards the Semantic web, helping you to improve search relevancy for your content is becoming increasingly critical. SEOPressor has built-in tools to help you control how the internet sees your site, without you having to touch a single line of code. Pretty cool stuff, right? This is a great improvement to the SEOPressor Connect plugin, something I don’t think the previous versions had, though, I could be wrong. You now have access to tools to help you to create XML sitemaps, control robot rule settings such as 301 redirection and canonical URL, customize Facebook OpenGraph and Twitter Card and more, all without needing additional plugins installed on your WordPress site. In addition, the Link Manager is a pretty cool feature by itself. It allows you to build and manage a flawless link structure for your website, again, a critical step towards helping you create a more user-friendly website. You can easily identify broken links quickly so that you can fix them promptly. See the image below. This is just another awesome feature in SEOPressor Connect. Yes, as you can clearly see, I love this plugin. Anyway, this feature allows you to analyze other keywords or phrases closely related or linked to your target keywords. This is super useful for helping you create content that flows naturally and is readable by humans. And of course, create content that will rank for relevant and related keywords that users might use to find your content in search engines. OK, so I’ve just gone over some of the key features in SEOPressor Connect, there are simply way too many additional features for me to list here. You’ll have to go and check them all out for yourself here. The Meta options in SEOPressor Connect are spot on. 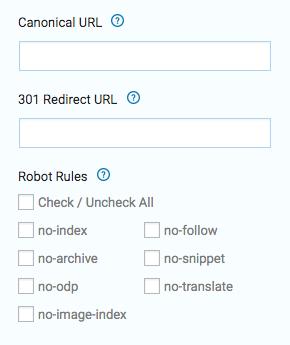 You have complete control over title tag, meta description, canonical URL, 301 redirect, and robot rules. For social optimization, you can enable and customize Facebook open graph and Twitter cards for each post or page. Although, if you’re using a social plugin like Social Warfare, you won’t need to touch any of these options. The latest version of SEOPressor, again which is version 6.2 at the time of updating this post, now offers two important options under advanced options. 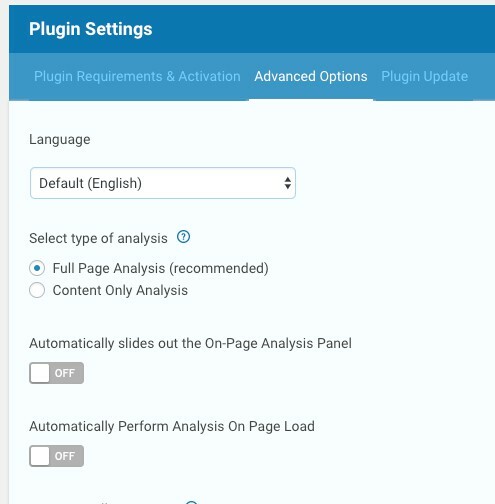 You can turn off “Automatically Perform Analysis On Page load” because before now, the automatic analysis feature was responsible for some issues like slow page load and server loads. While these features improve the performance all around, using other features like Site Audit and Link Manager still come with high resource usage. I personally use these features when I need to. My final thoughts on SEOPressor Connect? I thought the older versions of SEOPressor were good. Yes, it had a few flaws and bugs here and there, but today’s version is a complete transformation. SEOPressor 6.2 is even better. It’s a HUGE leap forwards, as far as I’m concerned anyway. You might try it out and think completely the opposite. I’ve not even mentioned things like having the ability to do homepage, site-wide, and local SEO. 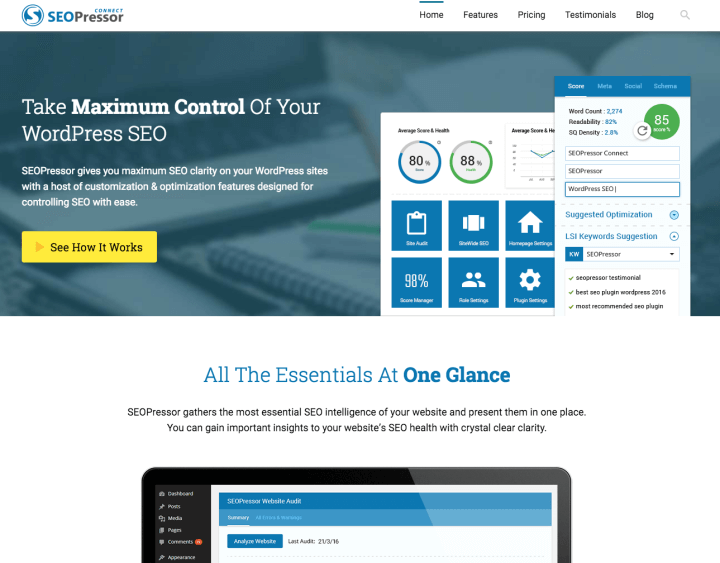 You’ll no doubt discover for yourself that SEOPressor Connect has a lot of options, built-in tools, and features, and it really is a complete solution WordPress websites. Recommended reading: Check out my full SEOPressor Connect tutorial here. OK, so let’s now take a look at some of the key features of the all-amazing free version of Yoast SEO plugin. Let’s start with some good old stats! WordPress SEO by Yoast has been downloaded over 3 million times from the WP repository, and there are two good reasons why. It’s free and it’s completely feature-packed! The snippet editor allows you to create the perfect and most compelling search engine search result listing possible. As you make changes in the snippet area, you’ll instantly begin to notice your SEO score improving, based on how you incorporate your focus keyword into your content and snippet content. The beauty with this is that you can see how your listing will appear in Google even before you make your post live, again encouraging you to make it more compelling to web searchers. With the free version of Yoast SEO plugin, you’re able to optimize for only one main focus keyword or key-phrase. The premium version allows you to optimize for more. 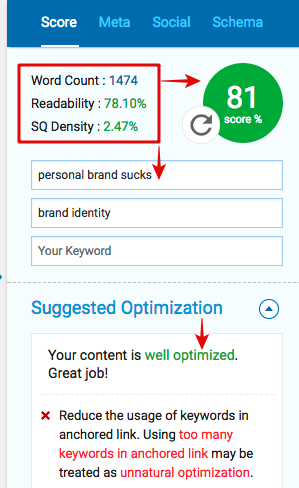 Like the SEOPressor plugin, the content analysis feature allows you to easily check your content to see how well it’s optimized for various ranking factors against your focus keyword. Changes happen in real-time as well here, so as you create your content around your focus keyword you’ll see more of those green blobs appearing. 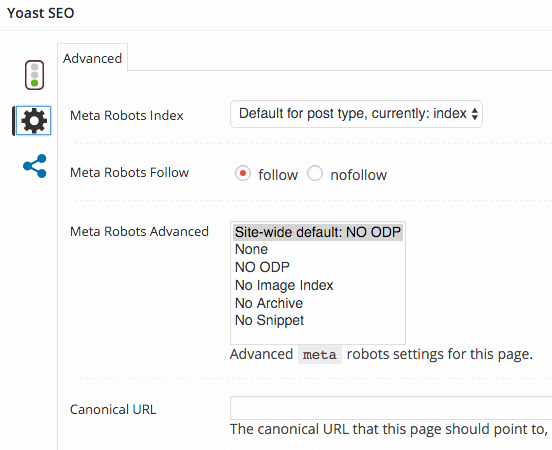 The Yoast plugin comes with built-in advanced settings for meta robots and canonical URL, yes the free version has this! With built-in social optimization tools for Facebook OpenGraph, Twitter, and Google+, you can ensure your content makes the most impact on social media. Note: If you’re using a social plugin like Social Warfare, you need not bother with the social options in either the Yoast or SEOPressor plugin. Once again, these are just some of the built-in options and features you get with the free version of Yoast SEO. You’ve probably noticed that whilst the paid-for SEOPressor Connect plugin has a ton to offer in terms of options, features, and usability, even the free version of Yoast SEO is pretty darn hard to beat. Not to forget that, with the premium version of Yoast SEO, you get a host of additional features including a redirect manager, ability to optimize for multiple keywords and premium support. So, WordPress SEO by Yoast is the clear winner here then, right? The site-wide options in the free version of Yoast SEO are what makes Yoast SEO such a great all-round plugin. While I love the site-wide SEO options in SEOPressor Connect, some things are definitely missing or lacking in that plugin. One critical feature missing in SEOPressor Connect, for me, is the ability to no-index sub-pages of archives. You can do this in Yoast, along with many other things, including stripping ‘category’ from ‘category’ permalinks, changing permalinks and RSS settings, etc. If those small things matter, not just for your website’s SEO, but usability, then Yoast is the plugin to go for. The free version of Yoast SEO already has a ton of built-in features as I mentioned. If you want a redirect feature, optimize for multiple keywords and premium support you’ll have to fork out $69 for the premium version. Plus, if you want to continue receiving updates and support, you’ll have to keep paying that each year. That’s not bad, considering the SEOPressor Connect subscription would cost you $108 per year. However, the $69 you pay for Yoast only gives you a license for 1 website/domain. Big kick in the rear end, right? If you want to use Yoast Premium on more sites you’ll have to purchase more licenses. This can be quite costly if you have more than one site. SEOPressor Connect, on the other hand, has all the built-in features of the free and premium versions of Yoast SEO, and a few additional features. Once again, there’s way too many for me to list in this post. The price you pay for SEOPressor is a one single monthly subscription fee of $9 ($108 per year), and that gives you a license to use SEOPressor for multiple domains/websites. So, based on ‘value’ alone, SEOPressor Connect is the clear winner, right? Well, I’ll leave that for you to decide, because you see, at the end of the day it comes down to pure preference. Oh no! I did it… Another middle of the road review! Wait, wait! I’m not done yet. I will say that each of these two plugins is great in their own respect and have a lot to offer. So, which plugin would YOU personally recommend using, Fabrizio? I use the free version of Yoast SEO for this website (Magnet4Blogging.net), and I use SEOPressor Connect for my personal brand website (fabriziovanmarciano.com), and my e-commerce website (vanmarcianopaintings.co.uk). Both of these plugins are serving me extremely well. Now, I would go as far to say that Yoast’s SEO plugin is a lot simpler, and a pain-free plugin to install and use. It’s so darn easy. The SEOPressor plugin, on the other hand, is a little more complex and takes a little bit of practice to make the most of it, especially getting around all those cool features. So which would I personally recommend? Either one, in all honesty. I know this is probably absolutely no help to you, and I could have saved you the time reading this post, however, I wanted to provide you with the options and benefits before you committed to anything. But seriously, both of these plugins are exceptional in their own rights. If I had to kill off one and choose just one plugin, it would be the SEOPressor Connect plugin. Simply because of the recently added features (The link manager feature, and the over-optimization tool, auditing tools, new advanced options. etc), and the new single-plan monthly subscription fee of just $9 makes this plugin attractively cost-effective. Of course, if you were looking for just a free plugin to use, then Yoast SEO free version would be the only one available to use. I hope you’ve enjoyed reading this little comparison review post, I’ve been as honest as I possibly can be about using both of these awesome SEO plugins. If you’re using either one of these yourself, do let me know how you’re getting on with whichever one. Which is YOUR favorite SEO plugin? Perhaps it’s something else entirely! 3. Thrive Leads Will Help You Build Your Email List Faster! Great post Fabrizio. I also have SEO Pressor and have seen a growing organic rise of targeted visitors. Do you have any experience with the Yoast Video SEO plugin? I’m a musician and singer and wish to optimise my music videos in Google as well as get rankings for my offline business sponsors who back my shows. I can’t decide between the two. But is it possible to have both Yoast and SEOPressor? Hi, I’ve heard cases where some people are using both plugins perfectly fine. I used to use SEOPressor alongside with Yoast plugin on a personal blog, it worked fine because I could take the on-page capabilities and score factors of SEOPressor and still benefit from the site wide options in Yoast’s plugin. So yeah I don’t see why not. Your best bet to be sure is to probably verify this with the creator of SEOPressor plugin. Great post Fabrizio! Thank you. I’ve been looking for a genuine review. Most of the others floating around can’t be trusted. With SEOPressor offering 50% commission rate to their affiliates, I’d imagine the first thing users would want to do is earn their money back without even using the plugin properly. You’ve basically covered exactly what I was concerned about. 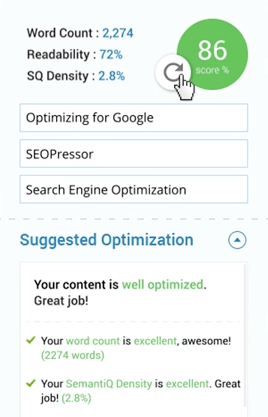 I’ve been using Yoast SEO for while now and as much as I love the features it offers, I’m tempted to switch over to SEOPressor because of their LSI recommendation, over optimization check, smart linking and multiple keyword features. I’m a hobbyist SEO myself and feel these features will help a lot everytime I post something. As a photographer it’s really difficult to repeatedly come up with text content, so optimal on-page seo is a necessity for me. SEOPressor seems to fit my needs. BUT, like yourself, I’m not too keen on the fact they lack some of the features you mentioned. Things like the ability to noindex, nofollow pages/posts, canonical URL, inability to remove the ?replytocom and stripping ‘category’ from URL. And No options for optimising your site’s homepage in SEOPressor?! Isn’t that a basic core function of SEO? Having said that, I use the Genesis Framework and hoping there are some simple code snippets to deal with some of the issues right? Like stripping the ‘category’ from the url, and removing ?replytocom? Hey buddy, really nice to read your detailed writeup! What if I use both SEO Yoast & SEOPressor together? Will it affect my blog. Please help asap! I really want to buy this, the traffic thing is such a strong point. I just checked your site page source and it clearly shows this. 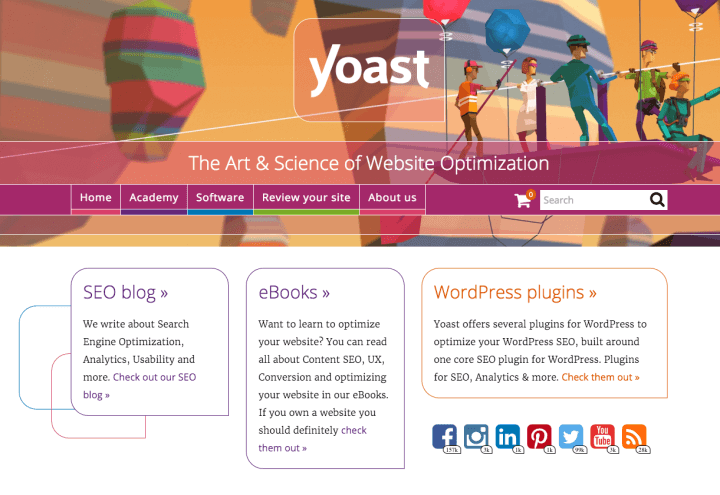 This site is optimized with the Yoast SEO plugin v3.1.2. Are you using both? Which is not a good idea or did you ditch this plugin? Hi Mamdani, If you read the post again carefully, I said I use SEOPressor Connect on my personal brand website at fabriziovanmarciano.com and Yoast on this site. Nice article Fabrizio! Are these LSI options good? Are they doing the job properly? Nice post. Thanks. What do you think of the “content OK/not OK” which has just been added to Yoast SEO? It’s trying to give you tips as to how to write a blog post. I’m not overly fond of that, but I just wanted to know what you think. Hi Yann, thanks for your comment. Yeah I’ve seen this on the latest update of the plugin. From initial thoughts, it’s more work and more time involved in making content great, or OK in this case. Whilst I was doing a content audit for my blog recently, I came across several posts that were ranking well in Google, but the content and SEO score Yoast was giving me was very poor, like in the red poor. So it’s a little bit confusing when you have content ranking well, but the scores doesn’t measure up. I think this new feature will certainly help content creators hone in on making their content better, as in more readable and generally user friendly, but it’s just more work in my mind.